I recently had the opportunity to design the poster for an upcoming show at the Ardmore Music Hall. The illustration is ink and watercolor, with hand drawn lettering inspired by the iconic fonts associated with the Grateful Dead. The show features Reed Mathis (Billy & the Kids), Todd Stoops (RAQ), Marcus Rezak (Stratosphere Allstars), Scotty Zwang (Dopapod), Hayley Jane, and Special Guests TBA. 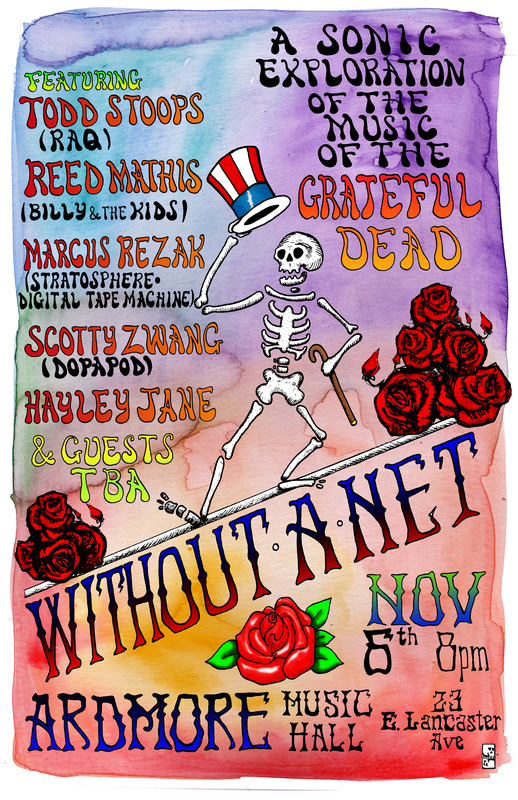 This entry was posted in Uncategorized and tagged ardmore music hall, art, edm, grateful dead, grateful dead tribute, hayley jane, illustration, jam bands, marcus rezak, philly music, reed mathis, scotty zwang, show poster, skulls and roses, todd stoops, without a net by josean. Bookmark the permalink. Reblogged this on Josean Rivera.